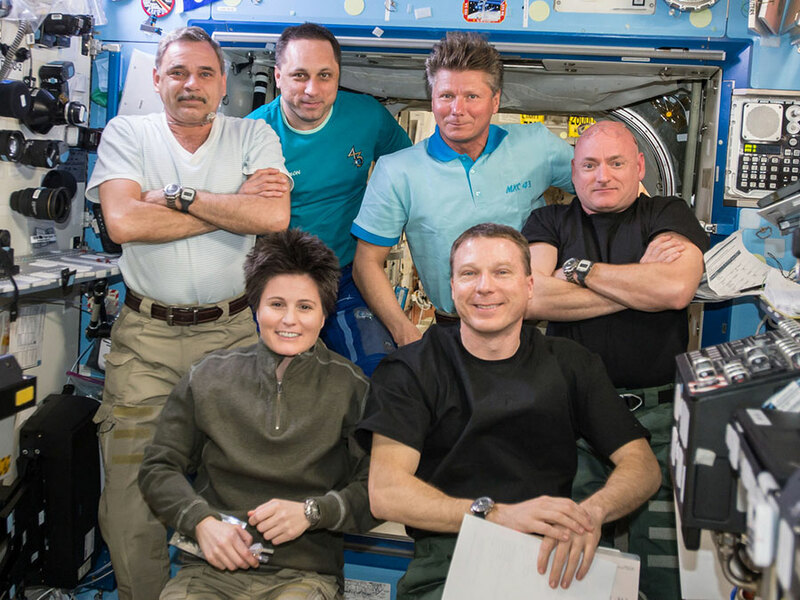 All six Expedition 43 crew members are gathered in the Destiny laboratory on board the International Space Station on Mar 30, 2015 after an emergency procedures training period. A wide variety of research exploring how life adapts to long-term exposure to microgravity took place on the International Space Station Friday. The crew members also worked on cargo transfers to and from a pair of docked vehicles. More crew Ocular Health eye checks were on the schedule as scientists study the fluid shifts caused by microgravity and how they affect a crew member’s vision. New software was loaded on computers for the Rodent Research study, a life sciences experiment that was delivered on a SpaceX mission in January. NASA astronaut Scott Kelly, who collected a saliva sample for stowage in a science freezer, and his twin brother on the ground Mark Kelly are the subjects of the Twins study. That investigation compares the two brothers, one in space and one on the ground, and explores how the different environments affect the twins with identical genes. On the Russian side of the orbital lab, the crew unloaded gear from the recently docked Soyuz TMA-16M spacecraft. The ISS Progress 57 space freighter, docked to the Pirs docking compartment, is also being packed with trash ahead of its departure and fiery disposal April 25. I just wanted to thank all that came before you and those that will come as well as all of you for your service regardless what nation you come from. It is sad that the world can’t take a page from your book by working together as a team toward a common goal,The Future survival of the planet we call home. Great shot. What is the temperature inside the ISS? It looks comfortable in short sleeved shirts. The temperature can be adjusted based on crew preference but is usually maintained between 21° to 24° C (70° to 75° F). Great Job. Take care everybody… God bless you all. Special thanks to Astronauts and Cosmonauts. Alles Gute für Euren weiteren Flug! Die Erde sieht toll aus vom Weltall. Um 20:50 Uhr fliegt Ihr über unser Haus. Viele Grüße aus Germany Anett ! Yes just wanted you,ll to know .Two of my son (age:20,22)and I (59yrs) with there friend just walked outside and watch the Space Station go by for 6 – minutes. @ 8:57 till 9:03 PM in Shelby,NC 28150. this is so great to be able to see the great traveler of human to take the tasks that other would love to do but never get the chance. you are doing what other dream of doing. I would love to be up there with you all,but I would probably could not stay away from the window. may peace be with you all, and have a safe trip back home .you have allot of pray holding you station up there .So GOD speed. Firstly, thanks: I appreciate your website, ability for me and others to read and see what is being studied and why, get to know more about the people involved..
Also I appreciate the commitment of the astronauts, especially being in space for so long, facing so many challenges. I have the spot the station app and every time we have visibility I go out and am sending out a ‘hello thinking of you’ up. Awesome to see the rapid white light passing by. Y’all don’t feel so far away seeing the station that way!